In 2010 Jónsi Birgisson, best known as the singer from Icelandic post-rock heroes Sigur Rós, teamed up with Fifty Nine Productions to create an extraordinary live show designed to tour the world. Not just a concert, but an exciting cross-artform collaboration, Go Live mixed music, projection, light and sound to bring Jónsi’s first solo album to life on stage. To create the show, 59 brought together an exceptional creative team, led by director Leo Warner. 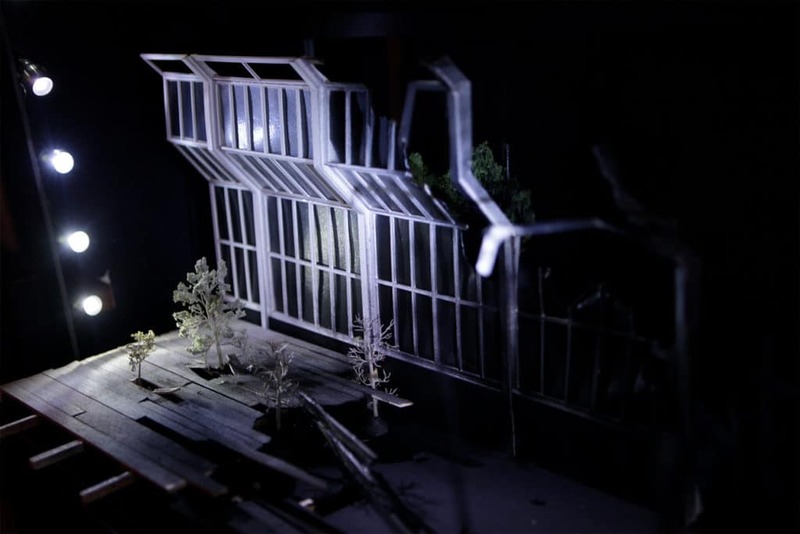 He co-designed the set with regular collaborator Phil Eddols and the projection with the other 59 directors Mark Grimmer and Lysander Ashton. Lighting designer Bruno Poet (who worked with 59 on Al Gran Sole Carico D’Amore, “the most acclaimed production of 2009 at the Salzburg Festival”) brought his “searing and shadowy emotional palette”; to the piece, ensuring lighting and projection work together seamlessly as one. Peter Stenhouse, 59’s director of animation, created the spectacular and sophisticated animation for the show, drawing out the themes and stories of the music, and which helped to transport the audience from one magical scene to another. Peter was the lead artist behind the virtuosic centrepiece for the Metropolitan Opera’s 125th Gala Anniversary, in which the animals from a famous Chagall mural came to life and led the stunned audience in a animated exploration of the inner workings of the Met stage. The show, in its completed form used both physical set elements and ephemeral components conjured up using a combination of projection, light and magic to transform the stage into a living world of animals, dynamic artwork and shifting ethereal landscapes. Go, Jónsi’s debut album under his own name, seeks to translate Sigur Rós’s elegiac, symphonic soundscapes into something approximating pop music, and is a qualified success. 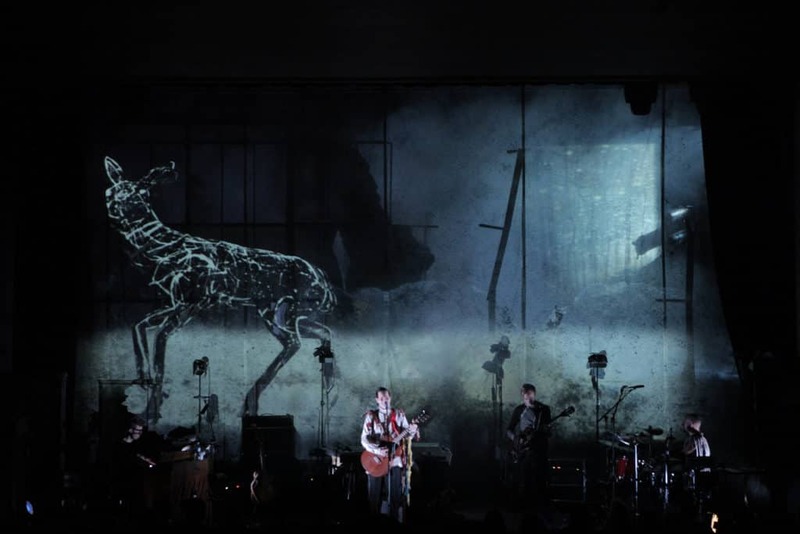 The material works better live, where a five-piece band – including Jónsi’s partner, Alex Somers, on guitar – and spectacular visuals by the theatrical design company 59 Productions combine in a truly hypnotic performance. The over-arching theme of Go, namely embracing the natural cycle of life, is summed up perfectly by the lyrics of “Animal Arithmetic”, “Every day, everywhere, people are so alive”. It’s conjured up here both in the projected nature imagery and the performance; in the ebbing and flowing of dynamics, especially throughout the first half of the set, and the wide-eyed childlike wonder that colours Jonsi’s songwriting. In one poignant moment, animated daisies open up and wilt only to be replaced by larger daisies and colourful, playful hummingbirds. 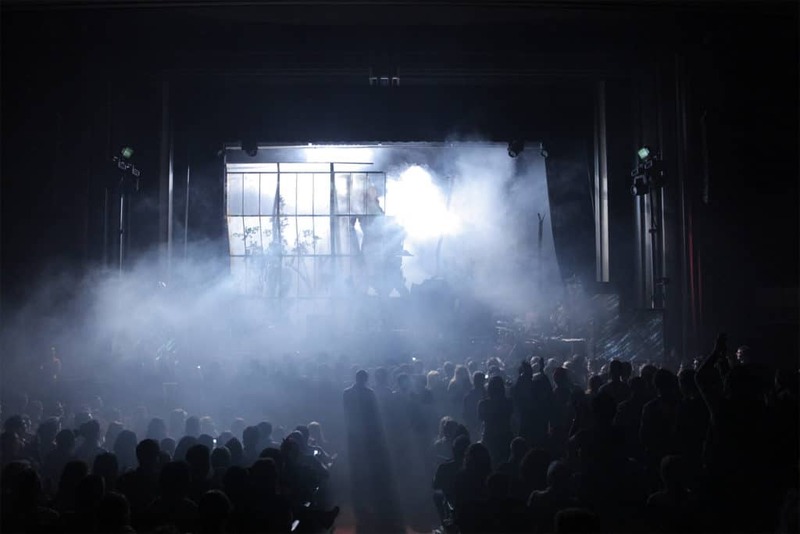 Devised by Fifty Nine Productions, a creative collective who work in theatre and film, the live show is a hybrid of arts that blasts the senses. The visuals continually morph – flames flicker across the forest stage, scratchy drawings of wolves hunt deer, hummingbirds caress tumbling flowers – you walk away greatly appreciative of nature. On a set that looked like the Museum of Natural History after a fire (trust me), a tight musical arc that fit the songs into one another like puzzle pieces, and gorgeous projections courtesy of London’s 59 Productions, the show was less winsome rock and more serious Theatre. For Jonsi, it’s more mystical: a step from the carnal to the spiritual realm, where he lingers in sustained incantations. His concert was a tribute to Nature, both sublime and pitiless. His backdrop was a window onto a dark forest; videos showed plants blossoming, predators pursuing prey and ravaging storms.